We handle a lot of support inquiries and one of the most common questions is how do people fully remove installed software, especially a security suite. Problem is, most people do not realize that the software is often in use when they start their computer. This makes it really tricky for Windows to fully remove in-use software from your PC. In theory, next time you boot the uninstall process should continue and remove the rest of the application, but this often fails to execute. Revo Uninstaller Pro 4 has been released and it’s one of those essential applications (more on this later) that people have had in their arsenal of system maintenance toolkits for years, mostly thanks to Revo Uninstaller Free. 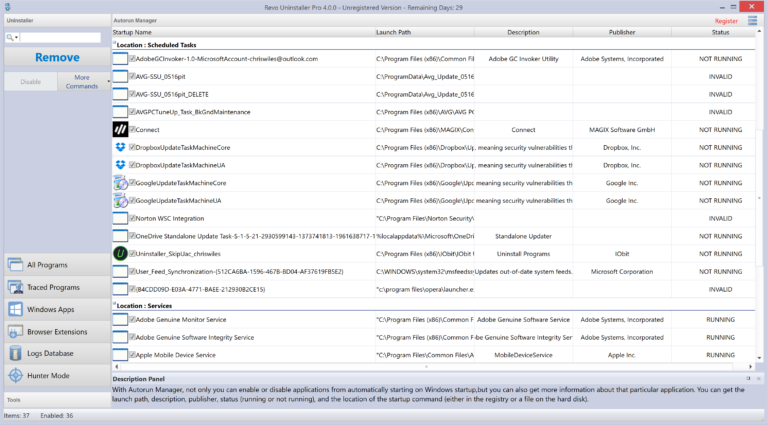 So, what’s new in Revo Uninstaller Pro 4? You are able to fully remove Windows 10 apps. Just like you can in Windows 10. In addition, you can search for and remove those pesky annoying browser extensions that get added each time you install new (security) software and similar tools. Just like you can do from within the browser then. At least Revo makes it easier to search across various browsers (Chrome, Firefox, Internet Explorer and Edge are supported). There’s also a new History Cleaner, which brings together previous modules into one new easier-to-find group. So you can find the Windows, Office and Browser Cleaner. The developer’s say that the UI is improved with a brand new theme, but to us, it really looks out of place on the modern Windows 10 UI, more suited to the period of Vista. At least you now get high DPI support for large monitors. Most of these features are not included in the old Free version which is now stuck on v2.0.5. The Free uninstaller simply supports removing traces of stubborn software, cleaning tools and little else. What you do get with Pro is the 'Hunter Mode' which will sit in the background and examine every new application you install on your computer. This allows Revo Uninstaller to understand the files written to your computer and the entries added to your Registry, to make sure it fully removes all traces of installed software. We said earlier Revo Uninstaller is one of those essential applications which people have used for years (well, the Free version). However, other removal tools have moved on and offer far more functionality and a much more modern user-interface. IObit Uninstaller 8 is one example. Download the trial of Revo Uninstaller Pro 4 and decide whether the $24.95 purchase price is a compelling reason to reach for your wallet.